Would you like to take a walk high above the treetops of Australia’s tropical rainforest? If yes, Mount Tamborine Skywalk is calling your name. Mount Tamborine Skywalk is South-east Queensland’s longest elevated canopy rainforest walk, located within Mount Tamborine National Park in the Gold Coast hinterland. I loved my visit to Mount Tamborine Skywalk, but I must admit that it seemed overpriced. If you are on a budget you can find other rainforest walks that are equally as stunning. The difference, of course, is that the Tamborine Skywalk takes you out over the rainforest and gives you a unique viewpoint. 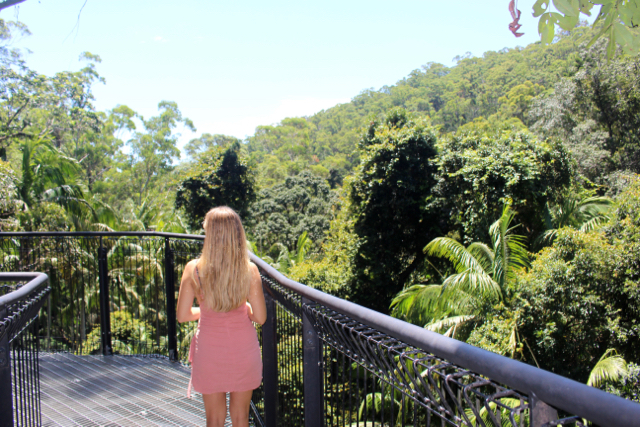 The Mt Tamborine Skywalk trail is a total of 1.5 km return and is a combination of skywalk bridges high above the rainforest and forest floor trails. The trail is relatively flat and suitable for families and all fitness types. 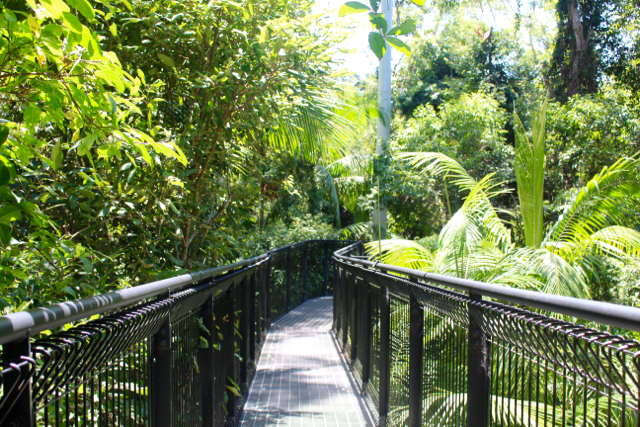 The Mount Tamborine Skywalk departs from the Eco Gallery and starts as a bridge above the Mt Tamborine rainforest. The first 300 metres is skywalk, high above the rainforest canopy. You can look beneath you through the bridge which is cool but could be scary for those afraid of heights. Make sure you don’t drop anything because you won’t be getting it back. The Mount Tamborine skywalk slowly descends onto a forest floor walk the takes you to creek lookout. You will then continue back along the loop toward the Cantilever Bridge which is a 40-metre long canopy walk approximately 30 metres above the creek and rainforest. The final section of the trail has a butterfly lookout and local history enclosure. You could complete the walk within 20 minutes, however, if stopping for photos and to read information along the way, it could take up to 1 hour. 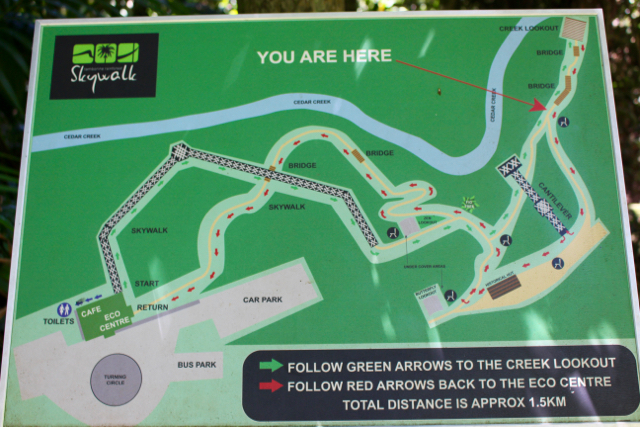 A Mount Tamborine Skywalk trail map is below. Mount Tamborine Skywalk opens from 9.30am – 5 pm. The last walk is at 4.00pm. The park is open every day except Christmas Day. I suggest taking hiking shoes, a camera, water bottle and backpack. Put everything in your backpack so you don’t risk dropping anything through the skywalk. If afraid of heights, reconsider doing the Mount Tamborine Skywalk. If you don’t want to spend money, don’t worry. There are lots of other FREE things to do in the area. Cedar Creek Falls is just one alternative. If you take rubbish into Mount Tamborine Skywalk, make sure you take it home with you. If you’re lucky you may be able to spot koalas, kangaroos, echidnas and other wildlife on your hike, so keep your eyes peeled. Cedar Creek Falls – a series of swimming holes and waterfalls found along Cedar Creek, just 5 minutes from Mount Tamborine Skywalk. Thunderbird Park – For the thrill seekers. Thunderbird Park has a high ropes course, horse riding and laser skirmish. Curtis Falls – a stunning waterfall that you can’t miss on a trip to Mount Tamborine. Mount Tamborine Village – stop in for lunch and some shopping. Enjoy a winery or brewery tour – Mount Tamborine is full of amazing wineries. Why not make a weekend of it and book accommodation on Mount Tamborine. If you found this post on visiting Mount Tamborine Skywalk helpful, pin it for later. 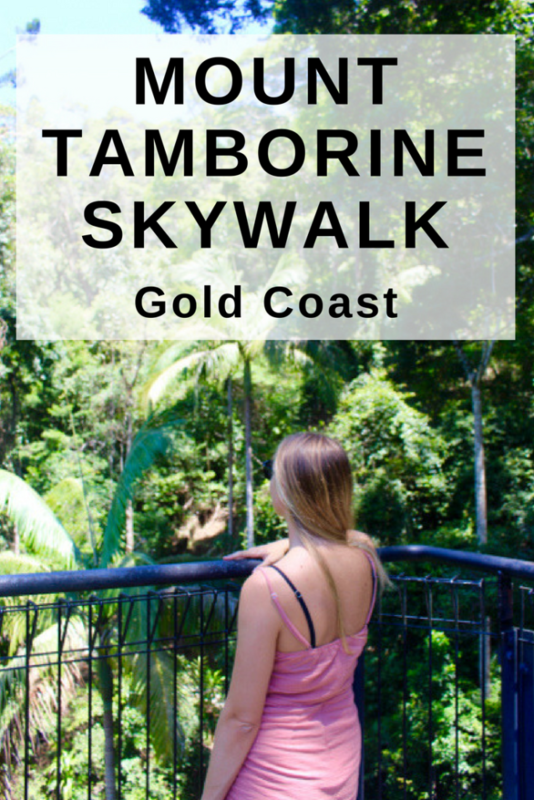 Disclosure: This post on Mount Tamborine Skywalk contains affiliate links.